Who do your employees trust? Is it your CEO, senior leaders, their line managers or peers? Where do they hear information that they think it credible? From the official internal comms channels, via the media or from each other? In January I wrote a guest article for @mazi on ‘It’s a matter of trust‘ and highlighted some of the findings from the Edelman Trust Barometer that had just been released. 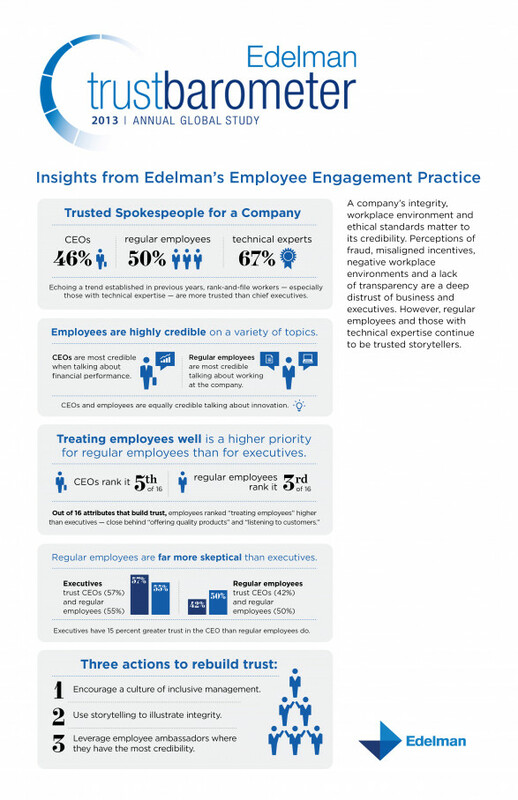 I thought I’d share some follow-up resources with you that have been published by Edelman today drawing on their report and specifically, actions for building trust. On this page you will find their infographic and two SlideShares. The research showed that peer-to-peer is key because employees trust ‘people like me’ – essential to bear in mind when it comes to communication. Now in its 13th year, the 2013 Edelman Trust Barometer research is the largest global exploration of trust and was conducted October-November 2012 across 26 countries. It revealed a ‘crisis of leadership,’ indicating the need for organisations to rebuild executives’ internal credibility reinforce ethical behaviour and adopt an inclusive management approach. The Edelman Trust Barometer measures the state of trust around the world by exploring it in institutions, industries, leaders, and the impact of recent crises in the banking and financial service sectors. The data revealed that employees continue to be a ‘steady, reliable source of information, especially compared to the CEO’ – with employees demonstrating technical expertise ranked at 67% trustworthy compared to the CEO at 43% and ‘regular employee’ at 50% – interesting definitions! So what can you do to help build trust? Using storytelling to demonstrate integrity in action – pair key messages with key stories from leaders’ actual experiences. Coach executives to mine their professional lives for anecdotes that demonstrate what company strategy, values and culture mean to them. Storytelling on ethics, compliance and integrity reinforces culture without lecturing. Encourage a culture of inclusive management – invite a variety of voices to the decision making table and listen to them. Allow employees to have a say in decisions that affect them. Regularly monitor employee sentiments internally and externally (Yammer, online focus groups, employee user groups, job-rating rates. When possible, act on feedback. Leverage employee ambassadors strategically where they have credibility – Tap employees as ambassadors on their company experience, benefits programmes, culture and working conditions. Leverage employees in recruiting; enlist volunteers to interact with candidates via the company’s digital and social channels. Showcase the “people behind the products” for innovation storytelling. All sounds like smart thinking to me. However, the third point jars. It has some brilliant elements – I’m particularly in favour of showing people behind the products and peer-to-peer communication. However I’m uncomfortable with words like ‘leveraging’ and ‘tap’ because I believe the focus should be on encouraging employees to communicate with each other, but not to have such a clinical and cynical approach. Trust to me is about people I find credible sharing information with me that I think to be true/shared with best intentions, or that I want to act on because of who they are, my relationship with them and how we take it forward. Within the context of an organisation, there are certainly many benefits to having strong relationships with people and working alongside them for the benefit of other employees. For example, I’ve overseen a number of change projects in organisations where the status quo changed – the smokefree workplace coming into effect and an upcoming IPO (initial public offering) for instance. In both companies and situations, rather than simply communicate what was happening, I led an employee consultation group and encouraged employees to communicate peer-to-peer, to be involved in the decision making process and to work through what the change meant at every level of the organisation and its impact. This meant “credible employees” to use the Edelman language – so in the case of smokefree, the smokers in particular had the opportunity to help shape what the new world looked like. They did this in a number of ways including creating maps of areas that could be used, determining new uses for the old smoking shelters etc. My point is that if I had approached it with a mindset of ‘strategically leveraging employee ambassadors’ it could have spectacularly backfired. The essence is the same, but language choice is essential. I think too often communications professionals have a tendency to get caught up in the language without thinking through the impact. I know how I would react if I was told I was ‘being leveraged as an employee ambassador’ rather than ‘being asked to share my views on a topic’ – see the difference? I welcome the content of the barometer and like the new SlideShares with the latest content. I’ve embedded them and a new infographic with the key findings below – it’s a good one! I’m interested in your thoughts on it – do Tweet me @AllthingsIC or feel free to comment below.